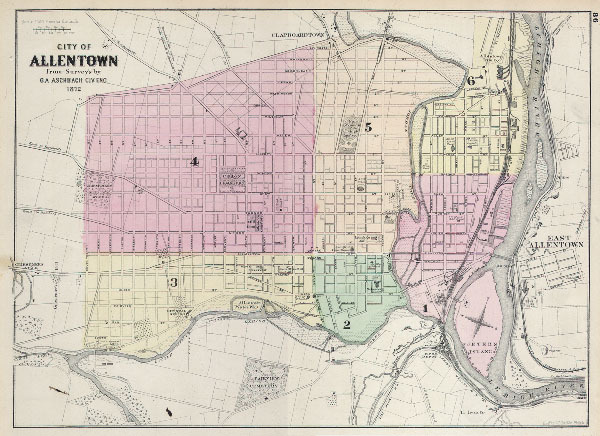 This is a fascinating 1872 map of the city of Allentown, Pennsylvania. Depicts the whole of the town at the street level and in considerable detail. Individual buildings, parks, and train lines are specifically noted. Allentown, made famous by Billy Joel's classic, 'Allentown,' was a prominent mill town in the late 19th and early 20th century. The whole is a lithograph engraving with beautiful vivid hand applied color washes. Very good condition. Part of Philadelphia map on verso.